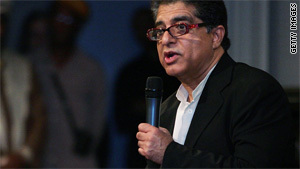 Editor's note: Deepak Chopra is a medical doctor, celebrity lecturer and author of more than 40 books on spirituality and mind-body medicine. He latest book is "Reinventing the Body, Resurrecting the Soul." Chopra was a Blue Ribbon Panel member who helped select the Top 10 CNN Heroes in 2007 and 2008. Carlsbad, California (CNN) -- Charity has always been a part of every spiritual tradition, and learning to give is an essential part of everyone's inner growth. However, charity has a dirty little secret that few of us want to face. It can fail or backfire. Our gifts can be squandered. A dollar given with compassion may wind up lining the pockets of someone who doesn't deserve it. It's a healthy sign that the public has become more aware of these drawbacks. Yet we have to be careful to ward off cynicism. To stop giving would be the wrong choice. Here's how I empower my own giving while at the same time bringing the compassionate gift closer to the right receiver. First of all, fuel an aspiration. The most hopeless people in the world aren't the poorest; they're the ones who can never fulfill even a tiny dream. As a group, women are the largest population of the helpless, so I look to help them any way I can. Invest in the future, which means directing your gift to young people. Ask for accountability. Know exactly where your money is going, and demand progress reports. Take advantage of the multiplier effect. The reason micro-financing has taken off like wildfire is that small loans to individuals to help them buy their own land or start their own businesses turn out to pay off handsomely. The businesses get started and flourish. The loans are repaid quickly and thus multiply the effect of your gift. I participate in Start Fund, started by philanthropist Fred Matser of the Netherlands. But there are now many online resources for directing your gift into micro-financing. Give generously of your spirit. If you can do this, money is secondary. Personal guidance, mentoring and encouragement happen on a one-to-one basis. If you can bring your spirit into contact with someone else's, your gift can change a life. These are simple, basic guidelines, but I believe in them wholeheartedly. I hope they come to mind the next time you get one of those annoying phone calls from a fast-talking, impersonal fundraiser who works for a cut of the money raised. There's a better way to give, and it's open to all of us. The opinions expressed in this commentary are solely those of Deepak Chopra.